The Oberoi Bali is located on Seminyak beach, an area known as the home of some of the most luxurious beach resort hotels in Indonesia. What sets the hotel apart from the rest are its many acres of tropical gardens, immediate access to 500-metres worth of clear sandy beaches, and the architectural use of Balinese traditional design. All the rooms and villas are housed within traditional thatched roofed buildings. Each of these rooms are lined with comfortable marble flooring, large windows that open out to the Indian Ocean, and giant king sized beds with hand carved headboards. A range of dining options are available to guests through the many open-air restaurants found on the grounds. The collective menus concentrate on Continental and Indonesian cuisine served in the traditional restaurant format or in the natural stone Amphitheatre, where authentic Balinese music and dancing are performed bi-weekly. For those in need of rest and relaxation, there is a wide selection of spa treatments available at the Oberoi Spa complex. Steal away the day in the private open-air massage pavilions, or relax by the pool overlooking the coast. With the Oberoi Bali bringing all the local flavour of Bali, from food to festivities, this hotel is the perfect place to get away and immerse yourself in a relaxed environment rich with culture. Hotel child prices apply to ages 2–11 years old. The Oberoi offers 74 rooms to choose from. A picturesque al fresco dining space overlooking Seminyak Beach. 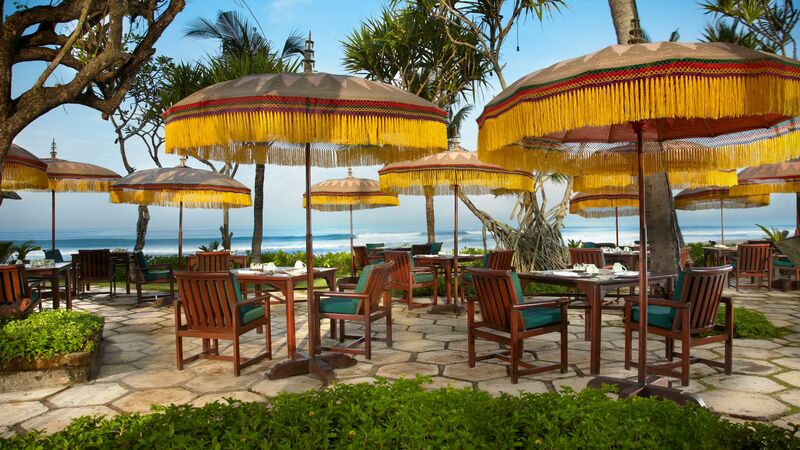 Enjoy your meal under the shade of Balinese parasols, surrounded by tropical frangipani, hibiscus, and coconut trees. Serving traditional Indonesian, American, and Continental breakfast and lunches. Open: 07:00 - 11:00 and 12:00 - 18:00. 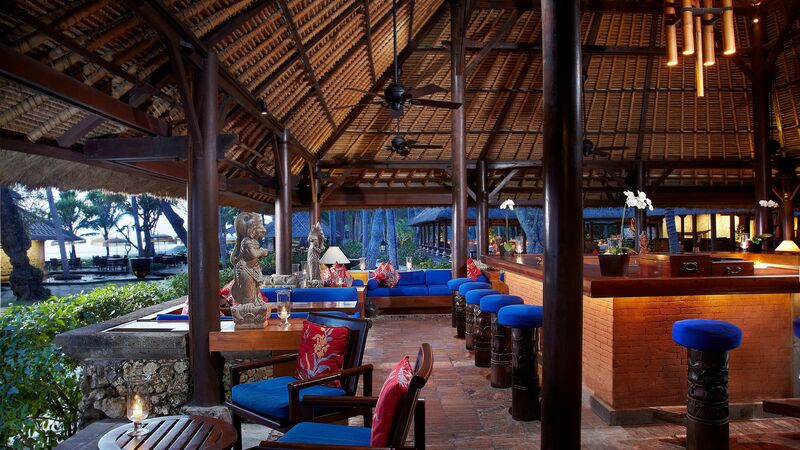 The word ‘Kayu’, in Indonesian, means ‘wood’, which the aesthetic of this bar plays to heavily within its décor. Here you’ll find ornate wooden carvings and fine polished teak furniture under a traditional Balinese thatched roof held high with intricately painted coconut tree pillars. Enjoy classic and contemporary cocktails, champagne and fine wines until late in the evening. An open air fine dining restaurant named after the kura-kura turtles whom come to nest in the nearby sands. 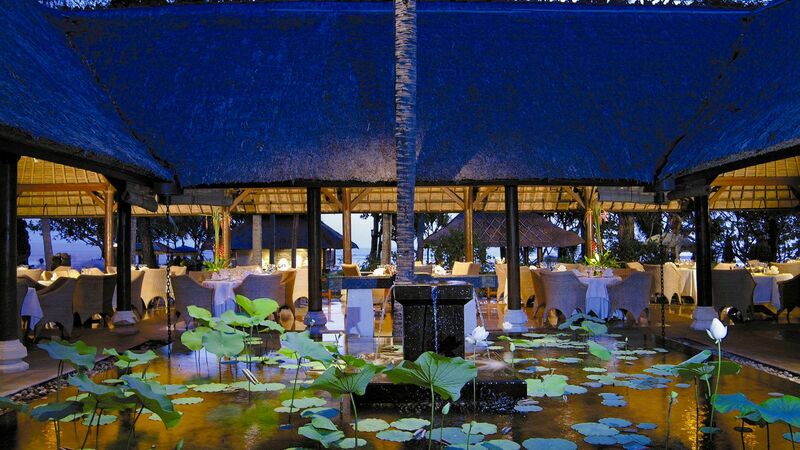 The restaurant serves Indonesian and European delicacies by the edges of the hotel’s charming lily pond. Carved out of natural stone and designed in the style of a Balinese palace arena, this venue offers fine dining al fresco style. 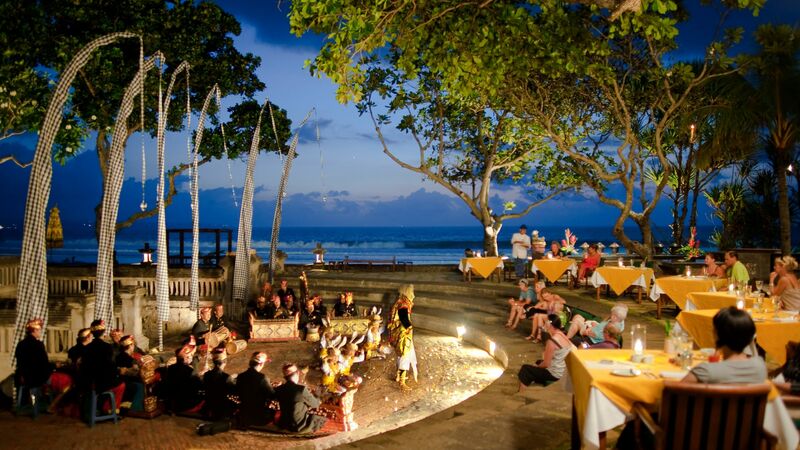 The Amphitheatre brings intimate, candlelit dining accompanied with bi-weekly performances by traditional Balinese dances and music. 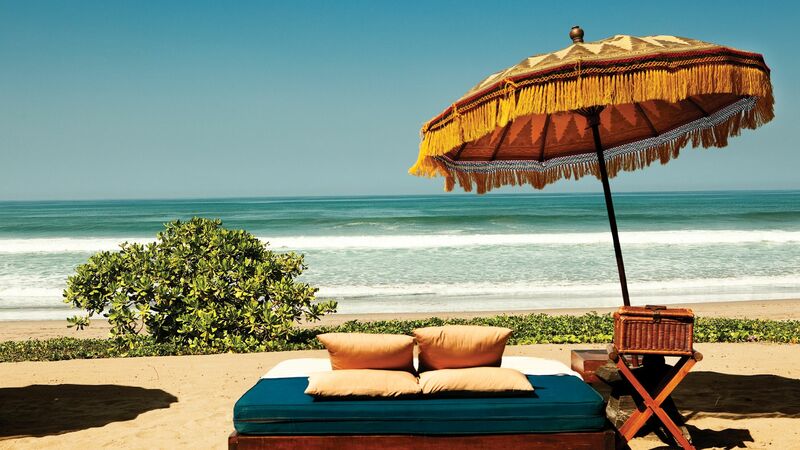 The Oberoi Bali has a swimming pool that runs alongside the Seminyak beachfront. Enjoy views of the sands and the majesty of the Indian Ocean from the poolside. Seminyak Beach is right in front of the hotel and offers chic beach clubs, laid back bars and plenty of space for those wanting to stretch out and relax. 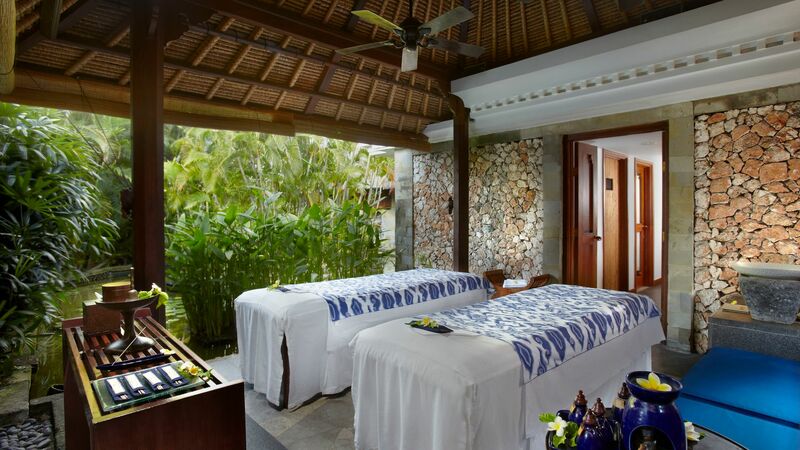 The spa features private therapy treatment rooms in peaceful open-air pavilions. Treatments available are of Balinese, Thai, and Western therapies, but also include signature Oberoi therapies that bring together ancient philosophies, modern sciences, and all natural ingredients. 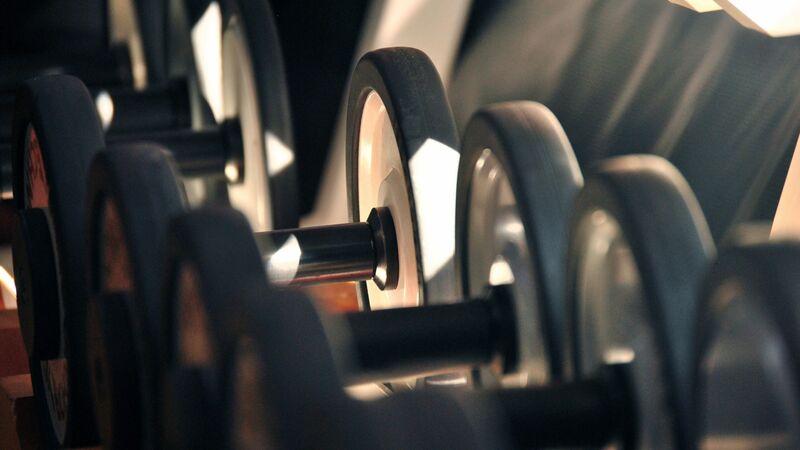 The hotel has an air conditioned open-plan gym area equipped with free weights, weight resistance and cardiovascular exercise machines. You can also enjoy beautiful views of the hotel’s tropical gardens while working out. Aqua pilates or beachfront yoga are also available to guests upon request. By the Oberoi Spa, there is a single floodlit tennis court available to guests. Complimentary tennis balls and rackets are provided to all, and with advance notice a tennis partner or private lessons can be arranged by the hotel. The Seminyak area of Bali is one of Indonesia's favourite beach resort destinations. It is home to many of the island’s upscale hotels, as well as luxury and sophisticated dining experiences, and a bolstering nightlife scene. Families and couples alike will find something for them here, with opportunities to be as active or relaxed as you choose. Cocktail bars and beach clubs are scattered up and down the coastline, along Seminyak’s picturesque white sand beaches. Surfers and swimmers alike will find plenty for them here. Further inland, you will find high end fashion boutiques, elegantly simple little cafés, art galleries and world class fine dining. 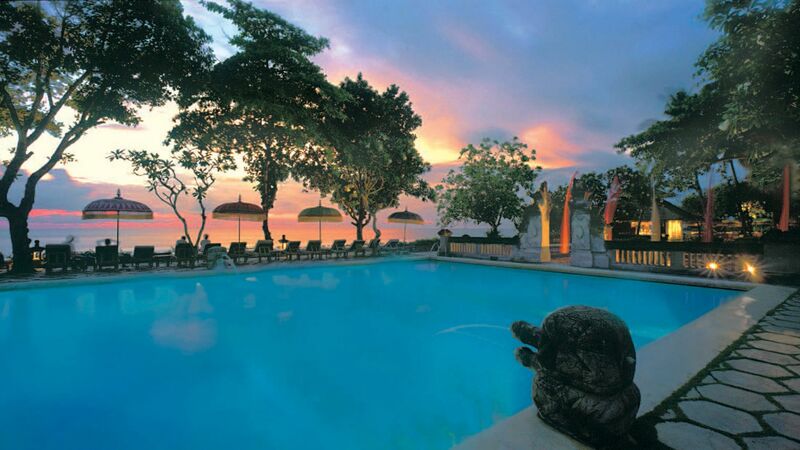 The Oberoi Bali is 30 minutes from Denpasar Airport. Luxury Lanai Garden View rooms feature a king-size bed, furnished work space and seating area. The bathrooms are tiled in soft grey Indonesian marble with a sunken bathtub and handheld shower. Luxury Lanai Partial Ocean View rooms feature a king-size bed, furnished work space and seating area. The bathrooms are tiled in soft grey Indonesian marble with a sunken bathtub and handheld shower. Luxury Lanai Ocean View rooms feature a king-size bed, furnished work space and seating area. The bathrooms are tiled in soft grey Indonesian marble with a sunken bathtub and handheld shower. Luxury Villas with Garden View are between 200 - 400m² and are furnished with rich polished wood and natural fabrics with high thatched roofs. The villas have an outdoor dining pavilion and a courtyard. The bathrooms have a large sunken marble bathtub, a handheld shower and a vanity area with double wash basins. Luxury Villa Ocean View are between 200 - 400m² and are furnished with rich polished wood and natural fabrics with high thatched roofs. The villas have an outdoor dining pavilion and a courtyard. The bathrooms have a large sunken marble bathtub, a handheld shower and a vanity area with double wash basins. Luxury Villas Garden View with Pool feature a tiled turquoise swimming pool measuring a minimum of 8.5 metres long with sun loungers and Balinese parasols. Luxury Villa Ocean View With Pool feature a tiled turquoise swimming pool measuring a minimum of 8.5 metres long with sun loungers and Balinese parasols. Save up to 10% discount on the hotel price booked 45 days prior to arrival for holidays between 01 April - 31 July 2018, 01 September - 21 December 2018 and 07 January - 31 March 2019. Save up to 25% discount when staying for a minimum of 6 nights for holidays between 01 April 31 July 2018 and 01 September - 31 October 2018 or save up to 25% discount when staying for a minimum of 3 nights for holidays between 01 November - 21 December 2018 and 07 January - 31 March 2019. Save up to 20% discount when staying between 4 - 5 nights for holidays between 01 April - 31 July 2018 and 01 September - 31 October 2018. Guests receive following when staying between 01 April 2018 - 31 March 2019. Sound dock for iPod in all rooms. Guests staying for a minimum of 6 nights can stay between The Oberoi Bali and The Oberoi Lombok in a single or double room with a minimum of 2 nights stay at either of the resorts for holidays between 01 April 30 June 2018, 01 September - 21 December 2018 and 07 January - 31 March 2019 (terms and conditions apply, please call our trusted advisers for further details). Honeymoon couples receive one 60 minutes massage at the spa when staying for a minimum of 3 nights for holidays between 01 April 2018 - 31 March 2019. Guests staying in a Luxury Villa Garden View, Luxury Villa Ocean View, Luxury Garden View with Pool and Luxury Villa Ocean View with Pool when staying for a minimum of 3 nights receive one three course candlelit dinner served in their villa or in a restaurant for holidays between 01 April -2018 - 31 March 2019. This hotel is beautiful. Situated I a quiet area facing the beach service is impeccable. Rooms were very large and they welcomed us with greetings because of our anniversary . We were tired and we decided to have Balinese massages and services were fabulous. They did everything possible to make us feel super special they succeeded . If you have a choice of staying in an Oberoi hotel go for it . It?? ?s always superb. Upon arrival, we were greeted at the taxi with flower leis. We were then escorted to the beautiful open air lobby, provided with a cool towel and tropical drink, comfortable seats at a casual table and then walked through the registration process, the amenities and whisked to our room. Just a perfect initial experience. The rooms are VERY well appointed, large and welcoming including a lovely bathroom atrium. The detached villas provide great privacy with easy access to the common areas. A key feature that we appreciated was the quiet, tranquil atmosphere in the resort. Just a great place to relax and enjoy Bali. The staff has a service model that is above anything we have experienced! The restaurant with a talented European chef is also exceptional. There is no need to leave this paradise! The sunsets and overall ocean vistas are breathtaking, weekly activities and local entertainment are offerred and a well appointed gym, adjacent beach and very large pool are on site with full complimentary towel service and frequently passed cold drinks. The large pool area was our favorite and the staff did everything possible to insure our comfort. If we needed anything, we only had to mention it and it appeared. The dining areas (outside or on the beach if you wish) are really special with picture book vistas, the menu so large and varied (Indonesian, Indian and European) and the food so good, we dined at the resort most nights. However, the real key to this property is the service level from the staff. John Halprin, the General Manager, must have a knack for training and motivating his people as the service from everyone was simply outstanding. The housekeepers, front desk staff, servers, pool attendants, everyone - were just wonderful to interact with and really made us feel that they we glad we were there. Such a unique experience these days. We can't offer enough praise for this extraordinary resort. We hope we can return in the future! Have had the pleasure of staying in some nice hotels around the world but must say that the Oberoi Bali is one of the best we have ever stayed at. From the moment you check in - everybody makes you feel like you are the center of the universe. The property, the rooms/villas and the beach is just brilliant and the fact that this little piece of paradise is located in the middle of the chaos and ???buzzle??? of Seminyak is just mind blowing. The resort is so peaceful and beautiful! In so many words this is ?? ?old school luxury??? at its best and the people who work here makes you never want to leave. This is most definitely the beginning of a beautiful friendship! Thank you! This was an absolute idyllic place for my weekend getaway. The service was phenomenal - they really think of every single detail including a spritzer and small bottle of sunscreen by your lounge chair poolside The location is also great if you want some nightlife or shopping. Rooms were spacious and the staff accommodating of my need for a late checkout. I was travelling by myself and they made me feel like a queen. Wish I had a week! !